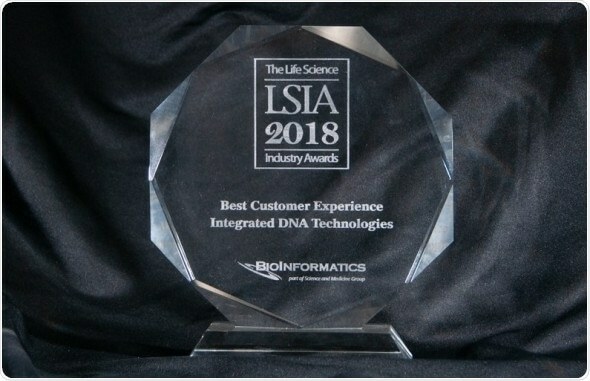 In recognition of its dedication to advocating for customers, Integrated DNA Technologies (IDT), has won a prestigious Life Science Industry Award for Best Overall Customer Experience, as well as a Gold award for Most Useful Website. The awards—entirely nominated and voted for by scientists—validate IDT’s continued efforts to support scientists at every stage of their research journey. Customers particularly appreciate the company’s personalized, easy, and effective human interactions at every touchpoint – anyone contacting IDT can expect to be helped efficiently by a customer service representative. The Life Science Industry Awards recognize innovative life science suppliers that help to advance biological research and drug discovery – and that scientists consider best-in-class. Two thousand scientists worldwide participated in the nomination and voting for the 2018 awards, with the winners announced at the end of last year. IDT topped competition from other respected companies to be announced the winner of the Best Overall Customer Experience category—signifying a highly elevated level of customer satisfaction and appreciation—an enormous achievement. Craig Overpeck, CEO of Award-Organizer BioInformatics Inc.
We’re absolutely delighted to have won the Life Science Industry Award for Best Overall Customer Experience. This is especially meaningful for us as a company started by scientists, for scientists. The recognition of IDT’s attention to all aspects of customer experience validates our unwavering focus on our customers and their work. Trey Martin, President of IDT. In addition, scientists also recognized IDT’s website with a Gold award in the Most Useful Website category – besting other industry leaders. IDT’s website has been specifically designed to save time and put the most up-to-date genomics information at researchers’ fingertips. It features IDT’s DECODED online newsletter—which provides detailed and comprehensive technical resources, easy-to-find product information arranged by application, fast navigation, a robust search function, and easy access from any device—enabling researchers to get to helpful resources whenever they need them. These awards show that life science customers really value a company that does more than provide innovative, high-quality and reliable products. It’s also about the whole journey and the relationship IDT has with them. That spans from the first visit to the website being a smooth, easy and informative process; to support in finding the right genomics solution; the straightforward and efficient buying process; the knowledgeable, personal, technical and after-sales support; and always getting through to a customer care representative. Johan Vanderhoeven, Senior Vice President of Sales and Marketing at IDT.